It's relatively portable and takes up a small amount of space, about 4 feet long, 5 feet high, and 2 feet deep. The top shelf is for controls and instrumentation, the middle contains the actual fusor, while the bottom shelf is for support equipment---the high-voltage supply and vacuum pumps. 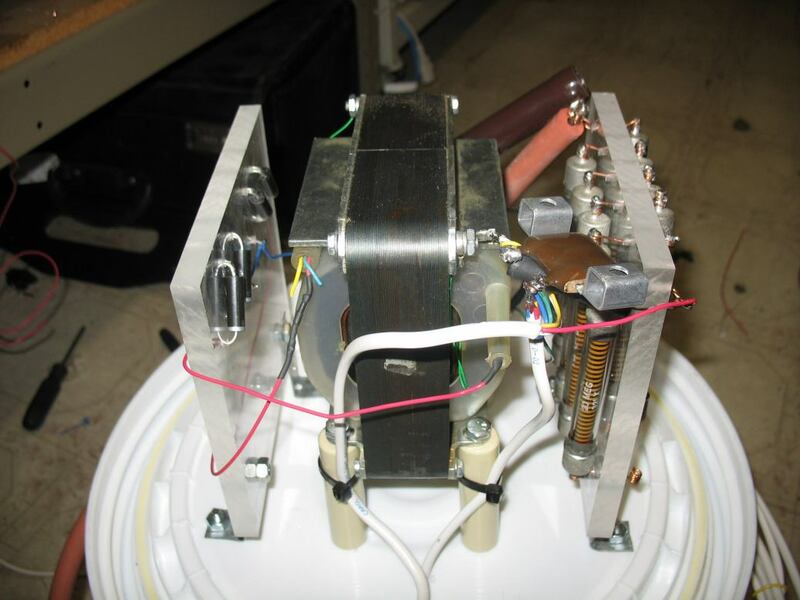 The fusor is relatively simple to control and measure, the main concerns being high voltage and pressure monitoring. At the left-hand side are my two pressure gauges, a thermocouple analog gauge and a digital capacitance manometer. The TC gauge can read from about 500 micrometers Hg to 10 micrometers Hg reliably (it's a Hastings-Raydist DV6 gauge/tube combo). The digital module below that is a Baratron 112A, the finest in 1980's technology. It was a steal at $50, and it reads from 1000 micrometers Hg down to 0.001 micrometers Hg. It has a serial interface, so I coded up a little program to read the output and put it in an RRD. It's not a very well-constructed program, to say the least. In the middle is the control panel (of sorts), which is comprised of a bunch of toggle switches hooked up to extension cords. At the top of the panel are two digital readouts, both of which became faulty after being exposed to excessive RF noise and EMPs due to fusor instability, etc. The fusor will gladly send lots of spurious noise into any data line, and it's killed electronic instrumentation of mine more than once. They'll get replaced by analog gauges soon. At the moment I'm using a DMM to stand in for them. 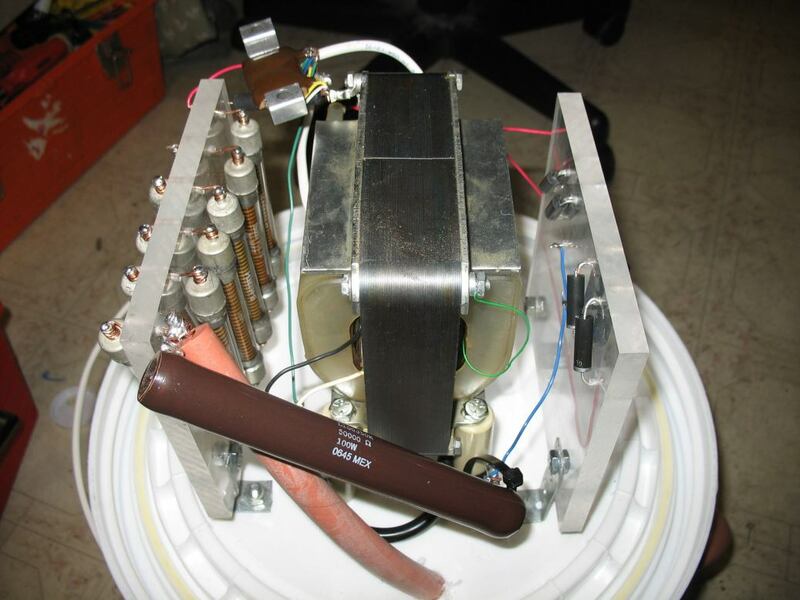 The large cylindrical black thing in the center is a 20amp Variac which I use to control the high-voltage transformer's output. Got it at a surplus store, and it's a wonderful thing to use. 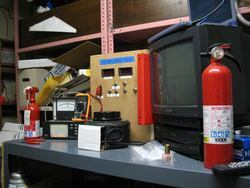 On the right hand side are the TV, VCR, and computer, which allow me to qualitatively control the fusor. The TV hooks up to a DV camcorder located underneath, and the computer on top is hooked up to it as well. The laptop actually runs this website, allowing the two live webcams to function. The nail polish is to fix up any spurious leaks that may occur (it seals hairline cracks really well, suprisingly), and inside the plastic bag is a BTI BDRPND bubble detector. 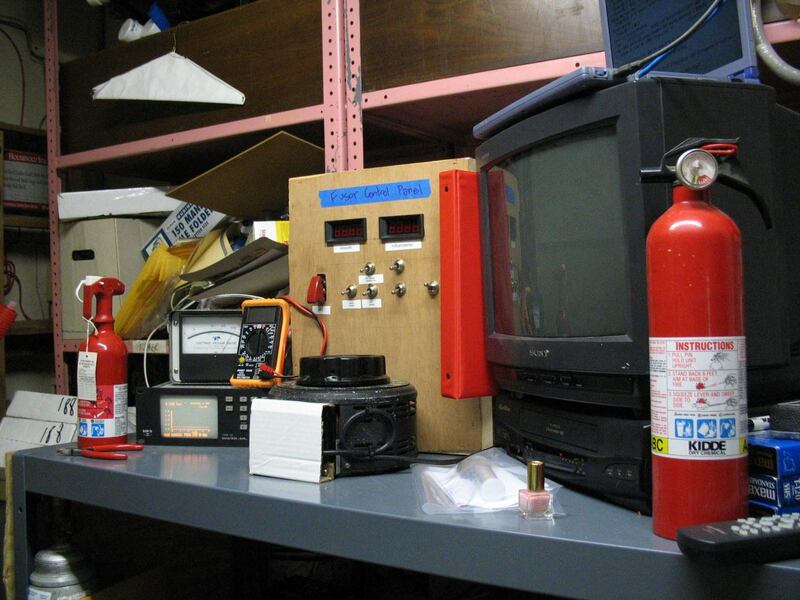 You can also see the two fire extinguishers on hand. I haven't had to use them yet, gladly. 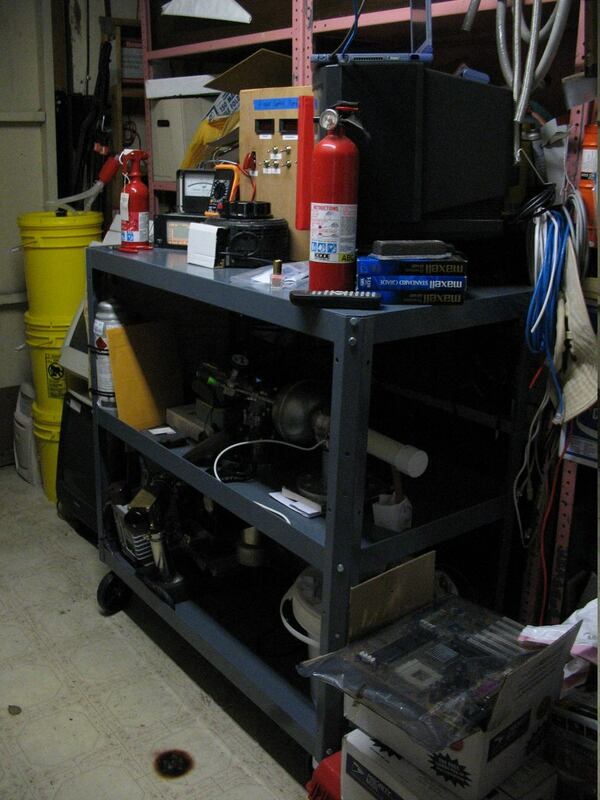 The middle shelf contains the fusor itself. Not much happens visibly here during operation, as most of the measurements are brought up top. 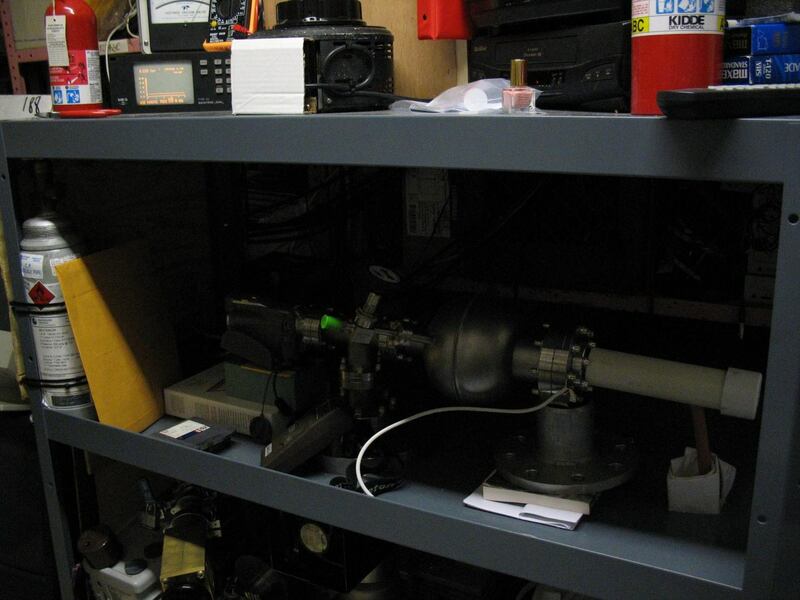 To the right of the deuterium cylinder is the DV camcorder which records poissor pictures and serves as the main webcam for fusor operation. Behind it, while not visible, is the Baratron pressure gauge that reports up to the digital display on the first shelf. It's a black box, so it doesn't show up very well. 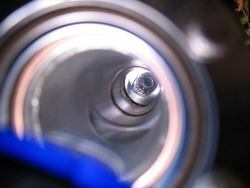 In the middle of the picture is the fusor itself. The main chamber was graciously donated to me by Wayne Rodgers of EDDY company, who had a fusor of his own. Ian Hall machined it while he provided the raw parts, and I'm very thankful they decided to give it to me. I watched Ian assemble it together from scratch, starting with nothing but a couple of stainless steel salad bowls and vacuum flanges. Very amazing stuff. Off of the chamber you can see a valve with a green cap on the end. 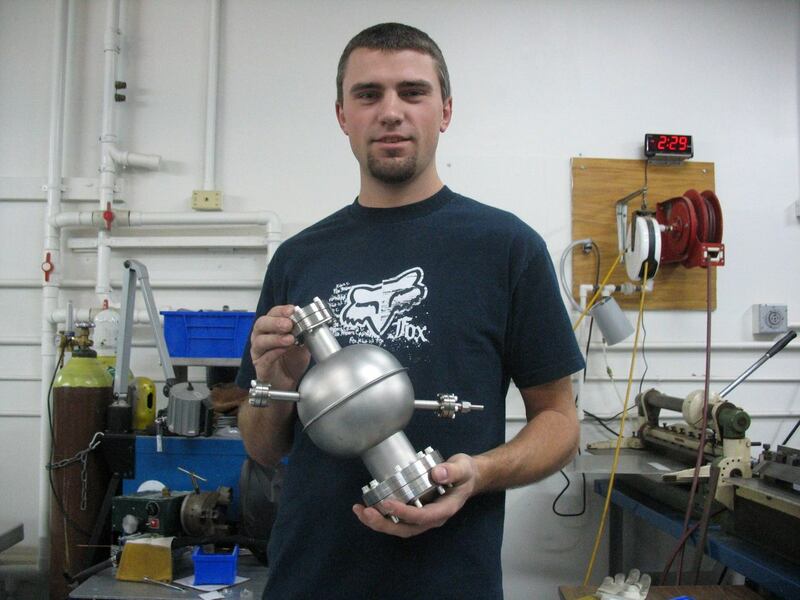 That's a vent valve (at the moment), and in the future I'll have a needle valve and some tubing attached to a regulator on the deuterium bottle in order to achieve real fusion. Not just yet, anyway. The white cable that attaches to a nut on the fusor is the ground wire, which completes the circuit and ensures that the case doesn't float to some 15 kilovolts while I'm not looking. To the right of that is the high-voltage feedthrough, a Ceramtec 16729-03-CF, shielded by a PVC pipe. It's rated to 30kV. The red wire goes down to the HV supply. 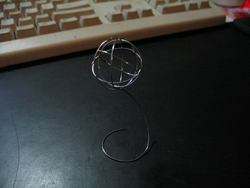 It's actually a little lopsided and unsymmetrical, as I made it in a rush while borrowing Jon Rosenstiel's spotwelder. That might account for the fact that star mode is so hard to achieve in my fusor, and that ion recirculation isn't as close to perfect as I'd like it to be. Maybe soon I'll get a chance to make new, proper one. 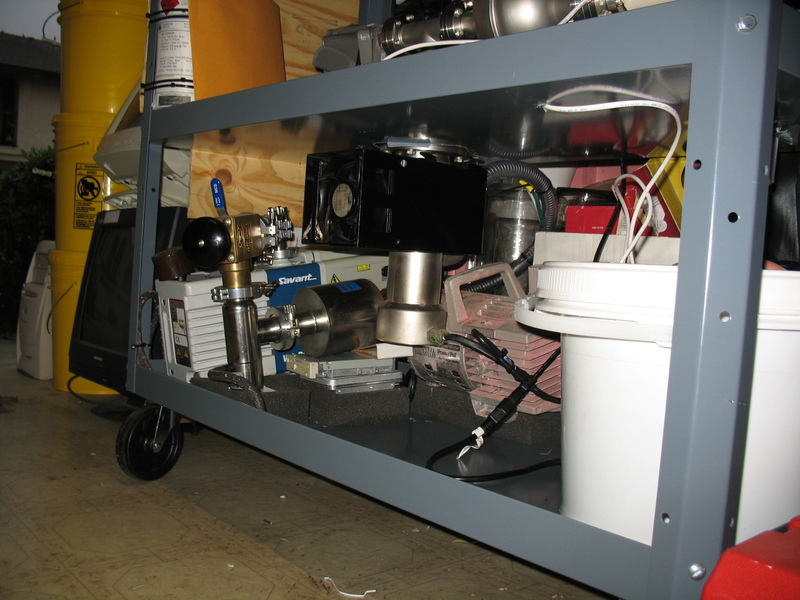 The bottom shelf contains the two vacuum pumps I have (a rotary vane pump and a diffusion pump), which allow me to pump down to 8.0*10^-4 Torr. Technically I should be able to go down to 1.0*10^-7 or so, but that's only in an ideal world. The high voltage supply is in a bucket of oil which you can see in the top picture. It's rated for 35kV at 7mA, and I built it myself. 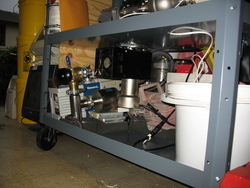 The air compressor (pinkish-painted object with a handle) is just there to supply pneumatic pressure to the pneumatic valve on the left, which joins the brass valve and the foreline trap. It's just a cheap substitute for a QF-40 90-degree bend, since I managed to pick it up on eBay for cheap. I also had the compressor handy from a long while ago, so it worked out well. The basis of my supply is a small dental X-ray transformer acquired from eBay for about $125. I've gone through three of them already, since they're only rated at 35kV/7mA per secondary winding, and I'm always tempted to press the system to its limits. Inside the bucket is all of the HV-related circuitry, including the voltage and current monitoring resistors/divider chains. The entire thing is then immersed in a bucket of dielectric oil (Shell Diala AX) to ensure nothing shorts itself out.